(SPOILERS) Well, that was a play. I’m not suggesting for a moment that all movies need to be sweepingly cinematic to resonate, but I do think some semblance of screen parlance tends to be appropriate, to recognize that the mediums are two different beasts, if you’re to translate one to the other effectively. Fences may well be a great play, but it’s a far from superlative movie. What may be most interesting about it is how this echoes into the Best Actor Oscar win, and to a lesser extent the Best Supporting Actor one. Most odds put the race between Denzel and Casey, and both films are admittedly very much character pieces. But, while Manchester by the Sea isn’t a film you’d exactly label as virtuoso in terms of cinematic language, it is very definitely cinema, and the performances are very much the product of actors rooted in cinema. 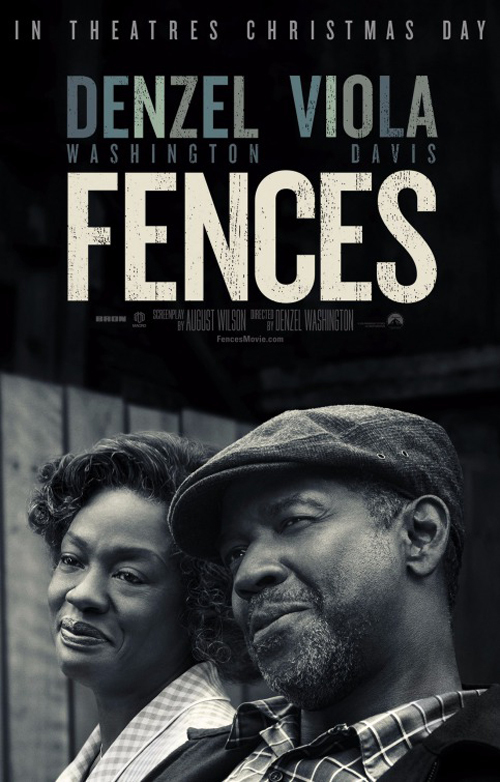 Everything about Denzel’s adaptation of Fences is rooted in treading the boards, and the extent of the bone it throws to leaving the theatre is pretty much shooting in an actual Pennsylvania backyard. Is this a bad thing? Well, if you love theatre, probably not. On the other hand, if you love theatre, you’d probably watch the stage production rather than the movie, given half a chance. James Foley did a fantastic job transforming Glengarry Glen Ross into a film, but even there, there are times you feel the tug of its original form robbing it of the quality of a complete film. Part of that is the Mamet method, but part of it is broader still; it’s simply the way theatre is often written, and Fences is written in a hugely theatrical way. Amadeus is also, and there’s theatre in the performances, but it’s a hugely cinematic film, so there’s no mutual exclusivity at play here. And so, back to the performances. Was Affleck better than Washington? He gave a more filmic performance, which is to say that an interior performance is likely to be more persuasive on the big screen than one designed for a theatre audience. By the same token, I Michelle Williams impact – a moment or scene often being the way movies exert their strongest influence – in that scene in Manchester by the Sea is more powerful than Davis’ more sustained work here. That said, Davis allows for the cinematic influence in her performance much more than her lead/director. The themes of Fences, of regret translating to self-denial and hurting those closest, are old ones, and August Wilson, in his slow-burn approach (I don’t know how long the play is, but it doesn’t feel like much was cut), enables an effective revolving of Washington’s Troy Maxson’s nearest and sometimes dearest as he interacts through his wife, sons, brother and best friend (Stephen Henderson – also in Manchester by the Sea). But – and I say this as a philistine who doesn’t take in a lot of theatre – I was very rarely not in mind of how this reminded me of other works, not least Death of a Salesman, and how it even ended on a note of the kind of half-baked “This is how plays end” borderline parody we saw the Coen brothers so acutely satirise in Barton Fink. Troy’s day-to-day existence revolves around how he perceives the race barrier held back his baseball career (Rose suggests he was too old to ever seriously have a chance of making it), and any aspiration anyone else has that threatens to put his trudge of a life in the shade – as a garbage man – reveals his overbearing, diminishing demeanour. That much isn’t such scintillating, but sporadically Fences proves engrossing, particular when it comes to Troy’s relationship with younger son Cory (Jovan Adepo, great in The Leftovers and surely bound for a bright future; he has star written all over him) as he sabotages his son’s dreams, makes excuses for his cynical treatment of his brain-damaged brother Gabriel (Mykelti Williamson) – it’s not such a clangingly unsubtle coincidence that Troy’s tall tales are about dealing with the devil while Gabe’s confabulations are about calling all to the pearly gates with St Peter – and refuses to see his musician elder son, Russell Hornsby’s Lyons, play (lest it remind him of his own failures). Davis’ might be the best written part here, except when – as the (screen)play is frequently prone to do – it delivers exposition in the place of exploring character through interaction (the number of times we stop and hear a story or backstory). Rose’s dutiful repression by one harping on about their own repression creates a double bind, and so the revelation of his infidelity, and her taking the only course available – turning to the church (the same church responsible for the language Troy uses to justify his behaviours, in terms of duty and the place of the wife) – is entirely believable. It might be that Washington was too close to the material, too respectful to Wilson (who died in 2005) to turn the picture into something more suitable to its medium. But hey, a sizeable enough audience has responded to Fences to justify his decision, and it’s always good to see the actor get his teeth into something meaty, as he too often rests easy on the laurels of playing iconically-bankable types.